Hospital bed mattresses provide a comfortable, healing surface for patients who have to spend increasing amounts of time in bed. Patients can select from a wide variety of items to reduce pressure and heal and prevent painful sores. All hospital bed mattresses are designed to fit over a standard hospital bed frame. 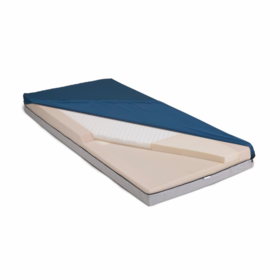 Each mattress adjusts to the frame when the head or foot sections are elevated. 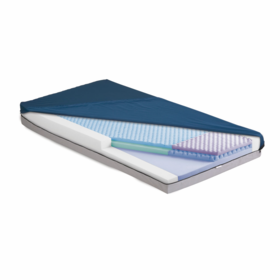 Each hospital bed mattress comes with a low-shear, water-resistant, anti-microbial soft stretch nylon top cover. The cover deflects perspiration and protects patient skin from painful friction. Each mattress also includes a fluid-proof triple laminate vinyl bottom cover, which allows the mattress to sit directly on the bed frame. The cover is equipped with an anti-contamination flap that covers the zipper, to prevent fluids from damaging the foam core. All fire sleeves meet Federal Fire Code 16 CFR part 1633. The hospital bed mattresses in this section are divided into 5 categories to offer the best therapeutic mattress for each patient. 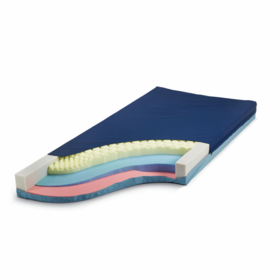 Therapeutic Mattresses offer optimal pressure redistribution using high resilient foams that contour to the patients body. These pressure relief mattresses provide support and a comfortable sleep surface. The Memory Foam Mattresses evenly distribute the patients weight. They provide the ultimate comfort and preventive therapy for patients looking for a premium foam mattress. 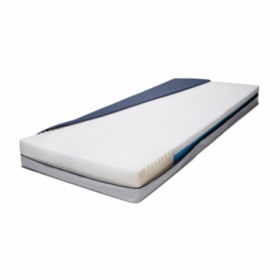 The bottom layer provides support and the mattress gets softer as it reaches the top layers. Gel infused memory foam provides a cooler sleep surface controlling heat and temperature on the patients skin. 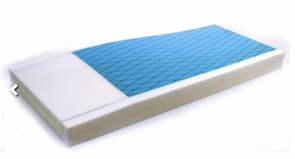 Gel Mattress Overlays work with a patients existing mattress. It combines soft cell foam with liquid gel to disperse pressure points to a wider surface area of the patient. The gel toppers provide pressure ulcer treatment for stage 1-2 pressure sores. Long Term Care Mattresses are designed for higher risk patients with a focus on pressure ulcer treatment and protecting high risk heels. These long term care hospital bed mattresses have 4 anatomic zones in the top layer with added lumbar support. The high resilient foams offer outstanding pressure redistribution, stability, and comfort for patients who spend more time in bed. 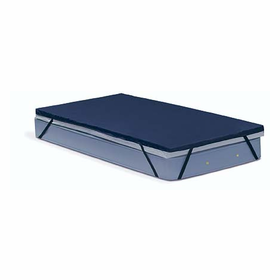 Bariatric Mattress are a premium long term care solution for larger or heavier patients. The multi layer foam design provides exceptional support, pressure redistribution, and comfort. *Side perimeters are available on some models, for patient safety.